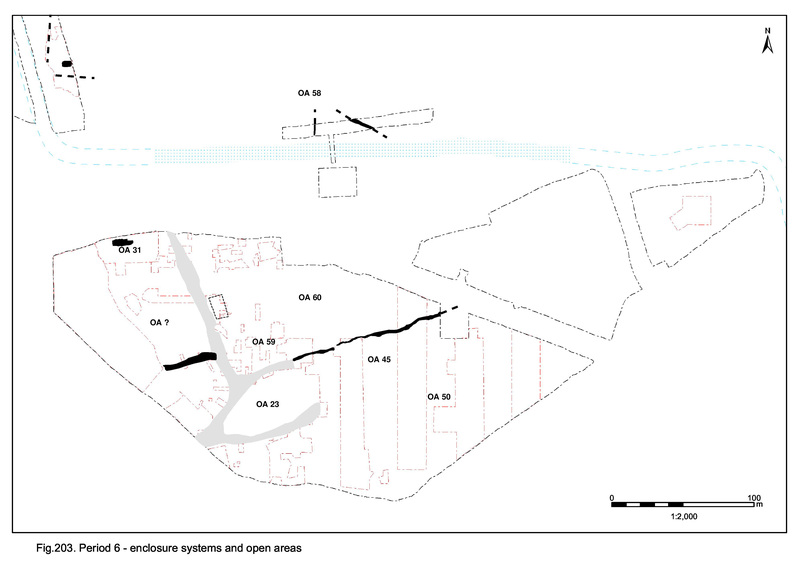 Perhaps the only definitively Early Saxon occupation feature in OA50 (and arguably across the whole of the lower terrace) is sunken-featured Building 65 (Figure 216). Seemingly isolated, the function of this structure is unclear. However, deposition in nearby pits could be related. 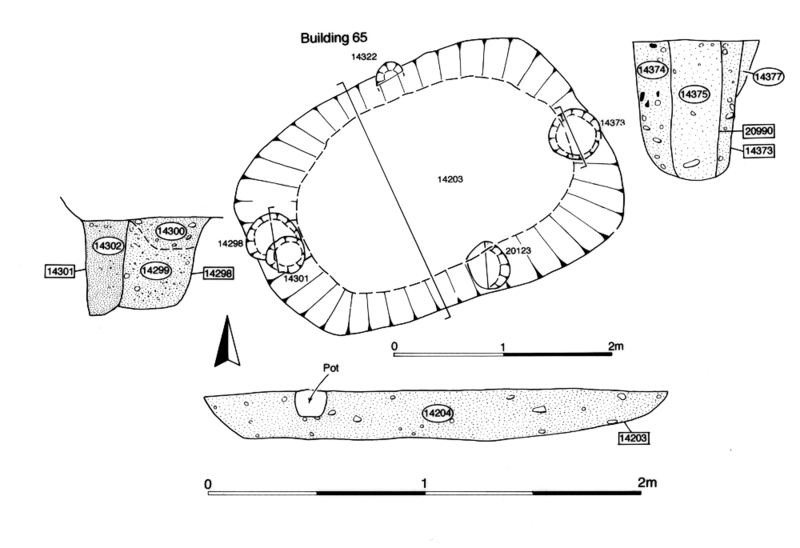 Other identified Early Saxon buildings lie at a much greater distance (i.e. on the Road 1 and 5 junction and north of the relict watercourse) and cannot be directly associated. Although most of the Early Saxon occupation activity seems to be located with little or no obvious reference to the former Roman period settlement, this is not the case with the OA50 pits. 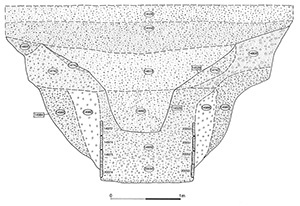 Building 65 comprises sub-rectangular cut 14203, 3.33m by 2.15m and 0.23m deep, with substantial post-holes 14298 and 14373 located at either end (Figure 216). Post-hole 14298 is 0.45m in diameter and 0.4m deep and 14373 0.5m by 0.66m deep; each contains a post-pipe. The single fill of 14203 contains a range of Roman material including late 4th-century pottery, tile, bone, a fragment of glass and a number of iron nails. Copper-alloy cast waste fragment (SF5537) is probably residual. Building 65 is interpreted as a sunken-floored building, although it is shallower than other examples identified within the settlement (see Northern hinterland, Open Area 58 and Northern hinterland, west of Road 1). Its NNE-SSW alignment reflects the orientation of earlier features and the building is likely to been positioned in relation to the surviving elements of the Late Roman landscape, though the influence of the alignment of the gravel terrace edge a short distance to the south of the building cannot be discounted. Taken at face value, the pottery from the fill of 14203 dates Building 65 (or at least its infilling) as latest Roman. This could perhaps suggest a Saxonising presence within the settlement prior to the end of the Roman period. Furthermore, it could be surmised that this earliest Saxon occupation occurred on the lower terrace - perhaps on the settlement peripheries - with subsequent 5th-century occupation relocating to higher ground to the north (Buildings 67-69 in Northern hinterland). However, the highly fragmented nature of the pottery assemblage is noted and is taken to be an indicator of its residual nature. It is more likely that this is actually a 5th-century assemblage that simply lacks the (generally few) sherds of diagnostic Saxon pottery. 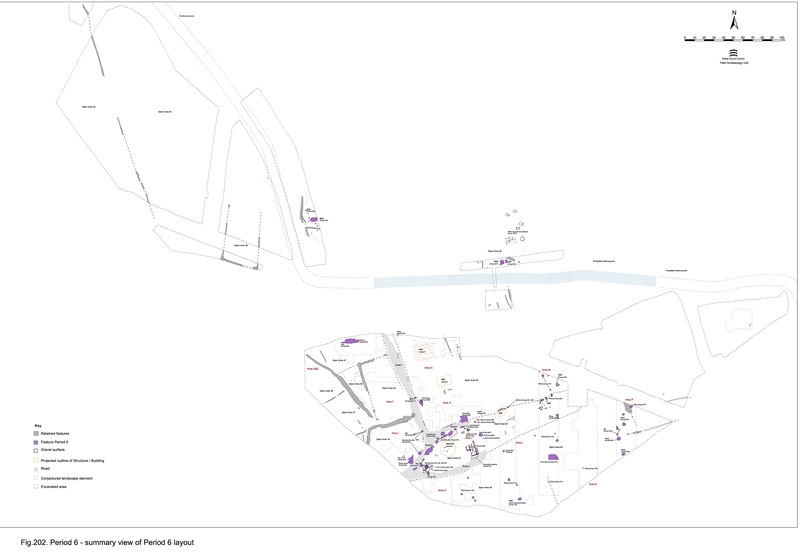 The proximity of 5th-century pits would also seem to be pertinent. Pits 14529 and 14632 lie in the western part of Open Area 50 (Excavation Area L). Both are similar, vertical-sided, relatively deep features and contain large artefact assemblages, much of the pottery content of which is significantly broken, abraded and residual (KPG40, dated to AD 400+). Animal bone is also frequent. 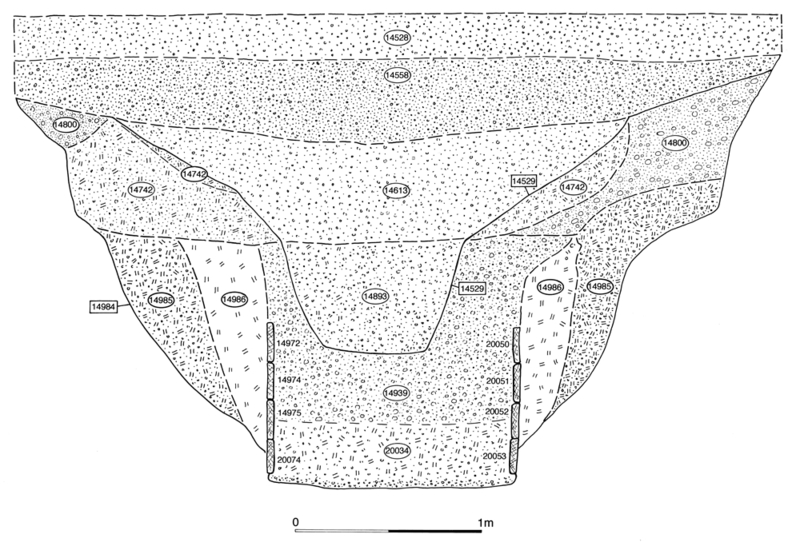 Pit 14529, 0.9m diameter and 0.65m deep, appears to be a deliberate reuse of backfilled well 14984 (Group 710 Period 4), being positioned at the centre of the large slump hollow of the earlier feature (Figure 157), but not intruding deep enough to encounter its closure deposit of animal carcasses (see Group 713). Among the finds from the fills of this pit is a quantity of antler off-cuts (SF6121). Also of note is the high quantity of Early Saxon pottery - 115 sherds from a total of 545 - and the presence of a 5th-century cruciform brooch (SF6238). 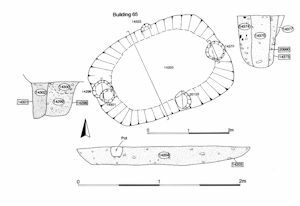 Pit 14632 is a larger, oval, cut of 2.8m maximum width and 1.1m depth.